Installing a home security system in Simsbury, CT or any other surrounding community makes a lot of sense. Not only can it help keep your home and family secure, but it can also raise the resale value of your property when the time comes to sell it. In order to install a security system properly, you need a trained electrician who can connect it to your power grid. You may be curious, however, to know exactly what they are installing. Here are 3 components in your security system that it pays to be aware of. Alarm panel. The alarm panel is the central box that monitors all of the sensors and other arrays that go into keeping our home secure. It is designed to trigger an alarm whenever a breach is detected, and in some cases contact the security company or police as well, depending on the kind of system you install. Contact alarms. Contact alarms consist of a circuit placed in your door or window frame. Once contact goes into the frame and another into the door or window itself, so that when the entry way is closed, the two contact are touching. When the system is activated, the two contacts complete a circuit that keeps your alarm from sounding. When the entryway opens, the circuit is broken and the alarm goes off. Some contact alarms also involve vibration sensors, which can spot when glass is broken but the wind frame remains untouched, for example. Motion detectors. Motion detectors are sensors that send infrared beams bouncing out across a given space. When those beams come back to it at a faster rate than they should – like when a human body moves across the space – then they activate the alarm. Motion detectors placed outside might turn on lights instead of activating the alarm. They can be adjusted to ignore smaller figures, such as household pets or woodland creatures like raccoons. 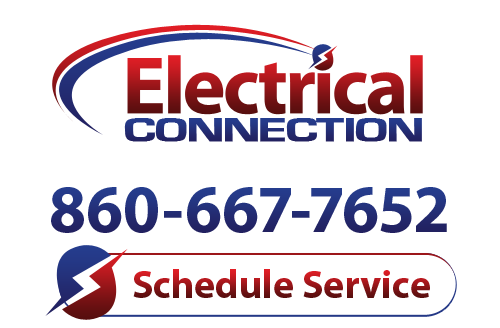 The experts at Electrical Connection, Inc. can install all of the components in your security system with professionals and pride, as well as answering any questions you may have. If you’d like a home security system installed by a professional electrician in Simsbury, CT, pick up the phone and give us a call today!